I'm on the Joy Clair blog today using 2 of the newest stamp sets. I used Faith Quotes and Be Brave for my first card. Using the MISTI I stamped the feather from the Be Brave stamp set in several colors of ink. The MISTI makes it easy to stamp several colors and keep the feather aligned at all times. I matted the feather panel with black cardstock, then wrapped Whisker Graphics twine around the panel. The panel was then added to a green card with foam adhesives for dimension. I added a phrase from Faith Quotes which I stamped in black ink and matted with black cardstock before adding to the card with foam adhesives. Shine Bright is from the Salt and the Light stamp set. I began by cutting strips of cardstock on an angle, then placed them on a cardstock panel so they radiated from one corner. Each strip was inked before adhering to the panel. Once adhered, I added embossing powder and heat set. Using foam adhesives, I added the panel to a black card. 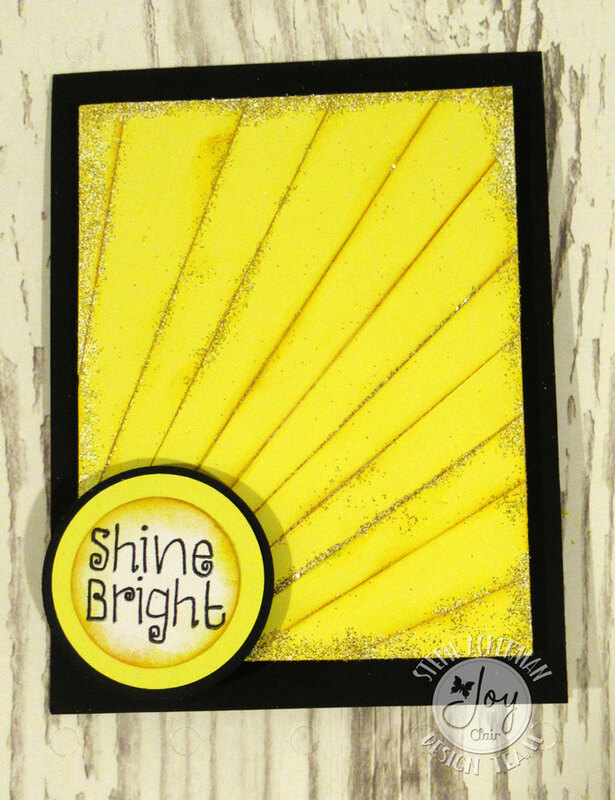 Shine Bright was stamped and die cut, then added to yellow and black die cut circles. It was also added to the corner of the card with foam adhesives.